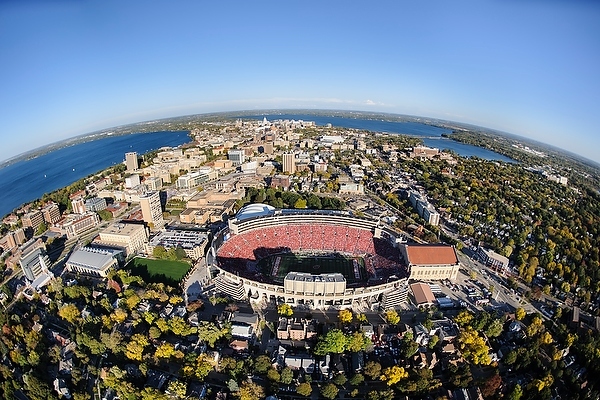 Aerial view of Camp Randall Stadium. Credit: Jeff Miller, University Communications, UW-Madison. Not long ago, come rain or storm, outdoor athletic events went on — regardless of the weather and its potential hazards. But today, improvements in weather forecasting are making it possible to ensure public safety during large outdoor college sporting events. And the safety of Badger football fans is on the minds of University of Wisconsin-Madison Police Department (UWPD) officials who are responsible for evacuating those 80,000 fans from Camp Randall Stadium should threatening or inclement weather develop. With weather forecasting expertise available on campus, the UW police turned to meteorologists at the Space Science and Engineering Center (SSEC) more than a decade ago for assistance with forecasts for Badger football home games. SSEC scientist Scott Lindstrom is one of several UW meteorologists who have volunteered to produce a forecast for a football game this fall. According to Lindstrom, “we pay particular attention to lightning, strong winds, or extreme heat” — things that could necessitate a stadium evacuation. Special Events Lieutenant Mark Silbernagel, UWPD, explains that the National Collegiate Athletic Association (NCAA), with guidance from the National Weather Service (NWS), has developed policies for severe weather, including thunderstorms and lightning. All universities must have weather emergency plans along with someone designated to monitor threatening weather and with the authority to make the decision to shelter spectators. Lindstrom recalls that in the years SSEC has been providing forecasts there was one close call last season when scientists and officials were monitoring a cell that was producing lightning, but it did not get close enough, or within six miles of campus, to trigger an evacuation of the stadium. The process of developing the forecast begins a few days prior to game day. UW police and emergency planners need a preliminary forecast on the Wednesday before each football game so that they can incorporate a weather emergency plan into event preparations if severe weather or threatening conditions appear likely. A clear picture and understanding of the dynamics of expected weather is crucial. Police need to be alerted, for example, to the possibility of extreme temperatures and the potential for heat (or cold) related medical issues that would require more paramedics on duty. Silbernagel explains that their planning “really begins in earnest at four hours pre-game” and includes an hour post-game: a total window of approximately eight hours. Providing a forecast for these parameters is straightforward for a couple of reasons, says Lindstrom. The forecasters use the highly accurate model outputs from the NWS to develop an overview. The other key piece to developing the game-day forecasts is experience. Lindstrom explains that the researchers making the forecasts know the bounds and range of how weather acts in Madison: what is likely to happen and what is not. Given the accuracy of the models and each scientist’s experience with them — 100-plus years among the seven scientists — Lindstrom and his colleagues can deliver a forecast with confidence. By Friday of game week, forecasters send their one-day forecast to UW police, and on Saturday, the day of the football game, provide updates if there are any changes. SSEC’s forecasts are critical to the planning process and help ensure the safety of those coming to campus, notes Silbernagel. It’s a great relationship that has expanded beyond football to include other outdoor events such as the spring commencement ceremony hosted by Chancellor Blank at Camp Randall. “They should get one every year,” adds Silbernagel.